This mount does NOT have to be fished up from a node, just fished it up randomly throwing my line just near a lake of Zandalar. Looks pretty fancy aswell! It looks like a jet ski with a tail. Fished this up on Beta in Windswept Pass. In open water. Trying to level cooking. Fishing was 150 Zandalari. Appears identical to Darkwater Skate sold at Darkmoon except that mount has green eyes and this one has orange. It is good to hear it can be caught in open water.because there is no abundance of schools along the ocean coastlines. Mmmm, these are going to be worth a pretty penny. Does it give you underwater breathing? I fished one up right there on the dock next to the ferry master in Tradewinds Market in open water. Kul Tiran fishing skill: 20. I was using the artifact fishing pole and Nat's Hat. I just fished mine up after around 300 casts on release day. Reeled one in, shortly after arriving in Boralus and having trained in fishing and then immediately going to the ocean by the Tradewinds Market. Caught after roughly 800 catches... only to lose it to a bug. Here's hoping another one doesn't take another 800 reels. I wanted to max fishing first so I fished right next to the Tradewinds Market; I fished up one after 1.5 hours and went straight to the AH and posted one for 300k (cheapest at the time). I went back to Tradewinds Market and got another one within 10 casts! So... I go to the AH again, and post the 2nd one, and the price had went from 300k to 275k In that time. I go back to Tradewinds Market again determined to get a 3rd one so I can actually equip it after and 40 minutes or so I actually get a 3rd one! However, In trade chat I notice people were trying to sell them for 150k now while I was still fishing; which means mine in the AH were probably not the lowest anymore. So I go back and check and they went from 300k to 125k in less than an hour. Fishing was not maxed out, caught it offshore in a snapper school. This thing dropped from my first cast in Zandalar, I am wondering what´s the drop rate for this? Am I just lucky or is it really high? The mount is unique and boe. Anyone know if you can continue to fish them up after obtaining one and either selling or learning it? I fished up one, saw it in my bag but had not decided whether to use it or to sell it. I had about 98 points into fishing, so around 130 + fish I think. The very next cast I got a second one, but even though it says "binds when used", you cannot hold a second one in the bag. It also says "unique". So farming these would be a bit more difficult than just fishing them up and taking a few to the AH together. You'd have to fish one up, toss it off in the mail to another toon or something and then fish for a second one. I was a little disappointed, but I have one so I'm good, lol. Caught my ray on my third cast in open water right at the dock in Zuldazar. These may not be hard to get, as I am rarely that lucky and it seems most comments say they have found a ray in 250 or less casts. This just dropped for me while fishing in a Frenzied Fangtooth pool. It was my 34th Kul Tiran fishing cast, so as others have said, this may not be a difficult one to get. Got mine with the first cast in BFA. Fishing is level Draenor lvl 1. Caught in Drustvar, at the Hangman's Point flight path in open water. BFA fishing skill 33. I know it doesn't really help anyone, but it was actually the first cast here. Could have been around 800 casts, had skill maxxed (obv) but I dont think it matters. Caught just south of Port of Zandalar. Got it in the 7th attempt at anyport / Kul Tiras (20, 45) in an open water, not in any pool. Fishing skill doesn't matter. I just fished mine up with 0 fishing skill for BfA. As this is BoE, does anyone know if this can be fished up multiple times? I have now fished up a total of five of these rays within 500 casts. Don't be taken in by high prices on the auction house. These are *not* very rare at this time. Skill: Started at 36 ended past 150 cap. Fished it out in one of the canals in Boralus. Kul Tiran fishing skill 20, no fishing rod, no bait. Rays of RNG. I got it after 401 casts in zuldazar at 69,68. happy farming! Seems to be fairly common currently. Several people in my guild got up to 3 during a 2-hour fishing session. I personally got 0 while leveling to 150, but got two within 10 minutes of each other this morning. I want to assume the drop rate feels higher because the expansion is new atm and people are leveling fishing and trying to catch fish for cooking. So the crazy catch numbers could be related to that. Either way, congrats to everyone who got theirs and the achievement. It's a pretty interesting looking mount. For those interested, I got mine fishing from the Port of Zandalar as did all of my guildmates who obtained them. Warmode on, Horde. I don't have any crazy fishing equipment. I maxed out my fishing skill and have tried Boralus and Drustvar for well over 500 casts and still nothing. Stood south Zuldazar at around 60, 65 where the fisherman are on the beach. Whilst there I maxed my fishing to 150, got the achievement for oil from fish, fished up a fair few midnight salmon. And when all hope was fading, it suddenly popped up. So when it popped I had 150 fishing, legendary pole, no lures. Caught this on release day at 87.2, 24.5 in Tiragarde Sound. Only took 30 or so casts to catch. Ugly mount. I already have water walking for mounted travel on water, and the Underlight Angler for fast underwater movement. Fortunately, the thing is BoE so it goes on the AH if the price is worth the effort. I guess I should buy a lotto ticket today, got it after 13 casts with a basic fishing pole and some nightcrawlers in Tidecross! I fished this up between 400-500 casts. I was standing off the dock in the port of Zandalar, next to the "Zandalari Fishermon". Fishing on the docks of Boralus, I got the 1000 Fish achievement slightly before I got the mount to drop. (I had learned fishing just before starting to farm for it). On Tuesday, I was able to fish up three of these in rapid succession in around ~300 casts. Now I have fished up another ~1200 casts and have not seen one. Blizzard may have reduced the fishing odds of this. /edit caught a second one in the exact same spot after 46 more casts, a third 43 more casts later, and a fourth one after 40 more casts. See the screenshot for the exact location (and proof)! Confirming this does not need any special items, locations or skill level. Caught this off the eastern shore of Drustvar in the river south of Hangman's Point. 154 casts. No fish node. No rod equipped or fishing gear/bait used, just basic fishing spell. Fishing skill was 73/150 Kul Tiran when caught. I started fishing for this at skill level 1 at the great bazaar as suggested in an earlier post. I got my mount at skill level 26. I learned the mount and kept fishing. I am now at skill level 116 and have not fished up another one. Kicking myself for not throwing it on the AH and then fishing mine up after. It took me roughly 450 - 500 casts to get this beauty, then after 20 more I got a second one. Fished up two of these within 5 minutes of each other. Fished in Nazmir, 135+33 in Fishing (artifact+Weather-Beaten Fishing Hat) and fished from Sand Shifter School. So I have uploaded a screenshot with my statistics but based on a lengthly fishing session of 925 successful are here as follows. and a few trashy greys..
Just got mine at 1:51am (est) 19-Aug-18 on Dazar'Alor docks @ 57,63 Zuldazar after roughly 17 minutes/30 casts with Zandalari Fishing @ 42/150 using Nat's Hat (with buff) and Underlight Angler pushing me with a +36. This is by far the nerdiest thing I've ever said. Anyway, judging by how soon I got it and the amount on the AH (average of 40k) I'd say this achievement/item is pretty easy to obtain. I wasn't even trying to fish for this, nor did I know that this was a thing, when I fished it up just now just outside of Shatterstone Harbor. No special fishing equipment, no lures, nothing. Just saw a node and fished it >.> Very strange. Tried fishing this from Xibala, Zuldazar (38.15, 75.38) and after 902 casts decided to call it for now. No fishing pole, No lures. This was during Night Time. Either I was somewhat unlucky with the mount or it can't drop from all coasts. Good luck fishin'! I continued my quest of fishing this up myself instead of buying it from the Auction House and I did eventually get the mount. Location and what fishes and how much I got from my second round of fishing can be found below. This time I went to Tradewinds Market, Tiragarde Sound (76.76, 24.46) using the anglers fishing raft and after 1331 casts I got the mount. This was during Day Time. Round three I went to the Bay of Kings, Zuldazar (57.96, 66.14), again with the anglers fishing raft and got quite lucky compared to the previous rounds. This time I got 4 Great Sea Rays, which took 999 casts. Based on my personal experience I would say the chance of getting the Ray might be quite a bit higher as your Zandalari Fishing goes up, but rng is rng and might be just that. Next round I'll stop being lazy and will get my poles/lures out of the bank. Good luck fishin'! Does anyone know how this stacks up speed wise against the Sea Turtle from WoD? Caught in Drustvar after 66 catches. Started at Kul Tiras fishing lv 1, ended up at 44. Location was: 72.3, 39.5, a little north of the Hangman's Point flight master. I just fished it up from a Lane Snapper School so it does drop from schools. Fished up 2 x Great Sea Ray within 450 casts at the pier in Boralus, one for me and one for my husband. Seem to have a good drop rate, me as well as many folk fishing around that area got the item relatively quickly, unlike other fishing obtainable mounts - such as the Pond Nettle . I wouldn't say it is worth buying one via the Auction House. If it wasn't already obvious, you only get the achievement Catchin' Some Rays if you fish up the ray yourself, you wont get the achievement solely by learning the mount. Good Luck folk. I have caught a few of these Sea Rays now, one in Zuldazar in Dazar'alor, and one just off the dock of Boralus. You can catch this mount multiple times, however you can only keep one in your inventory at a time. "The rays of the great sea can travel for many miles in great migratory patterns." ...does anyone think this mount might be more common in different zones at different times? ...meaning they have a migratory pattern? I'm seeing some people here say they caught a bunch in a short time, and I have friends with that experience - while others are saying hundreds of casts before they caught one. I dont know if this has been said but you CAN fish up more after adding it to your mounts. Caught in Inland, Coastal, and Pools. Anywhere in Battle For Azeroth Zones. After about an hour of fishing, I finally caught one. However my guildie who was sat next to me fishing, caught 4 before I caught my first one. You're either very lucky or very unlucky with this one. Goodluck. I feel like the drop rate of these was significantly nerfed in the evening somewhere between the 17th and 18th. I have been farming these and prior to this they were dropping like candy, most of them dropping in under 15 minutes, a few of them in under 5, and one of them after three casts. The longest time before I caught one was about an hour. I caught and sold 13 of these prior to the dates mentioned, for the record. Since then I have caught three - the first one taking about three hours, the second one about two hours, and the third one around 45 minutes. The number of great sea rays posted on the auction house has also gone down markedly, although the prices have been virtually unaffected. A friend who was fishing alongside me on a couple of occasions had the same experience with the drop rates. Has anyone else who was farming these prior to the 18th noticed this change, or have I just had an extremely unlikely lucky streak? I've been fishing with most of the highest possible fishing gear/bonuses, but historically I don't think this has ever really affected drop rates. Probably doesn't here either, I've been doing it just in case and also for the sweet placebo feeling. Fished mine today in a Slimy Mackerel node. Okay, so I am at 150 fishing for BFA. Do skill increase items for fishing affect drop rate of items such as this mount? 99% of the time, I get fish with my 150 skill (1 or 2 gray drops in 30 min). Got mine on the 411 cast standing next to Akan on the dock at Anyport, Drustvar. Took me 260 casts, but I finally got it! It seems that as of 8/23/2018 Blizzard has removed the unique tag from this item. I've got 5 of them in my bags now. 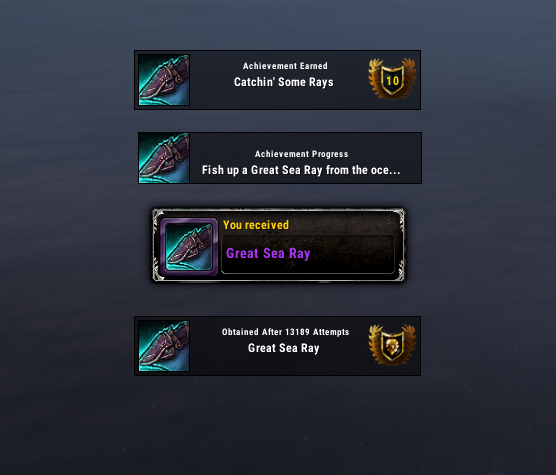 So i was fishing the Great Sea Ray up as i wanted it for a mount. I was at Zuldazar @77,63 and didn't move i caught 2 but it should have been 3.
it closed the loot window. i didn't notice the mount was a unique. But i fished up 3 in a total of 593 casts. and a handful of grays. Like this is going to be a RARE find. Posts here are showing people landing several of these before even maxing out on BfA fishing. On my server, it is down to 10K gold (the highest is at only 48K gold) and dropping fast. One player has 3 for sale, one 5, one 7, and one 8 and this is only on the first of two pages (Thrall). Don't expect to make a big profit on these as the "happy time for selling Great Sea Rays!" is already over.﻿ I sold mine for 9K gold and was glad to get that much for it. It will be down in 1-2K gold soon. Dropped for me after ~300-400 fishes. Sadly i got "Internal Bag Error" and the drop disappeared. I've noticed quite a lot of forum posts about this issue. In my experiance this has to do with BfA fishing and "Auto loot". I recommend shift+loot or disable auto loot so this doesn't happen to you. I got two in less than 120 casts. Fishing level was only about 100. I am at well over 1000 casts at 150 fishing and no drop. Other drop percentages line up tho, thats rng for ya. Just got my first this morning. Had probably caught 300 or so fish since launch. Was using my Underlight Angler + Weather-Beaten Fishing Hat + Trawler Totem. Got it while fishing off the docks in the Port of Zandalar in just open water, no pools. Got my second one on my 101st cast of the day about 30min after the first one. Thinking I should keep this up. In case you are wondering, this mount provides the SAME speed bonus as the Sea Turtle, but unlike the Sea Turtle it can only be used on water. The price of these on US Dalaran Horde has seen a dramatic change between last week and today. They were going up for around 15K, now you can get them for around 5K. level 10 fishing to level 150 fishing + a ton of casts later, finally got myself one! 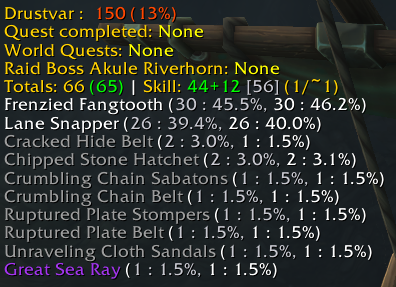 Just got this today after atleast 80 tries (about 25-30 minutes) and can confirm I was only 63 skill in Kul'Tiran Fishing when I got the drop. Used an Underlight Angler in Tiragarde Sound cords . I think the drop rate on this has been ninja nerfed. i fished for quite some hours last night while watching Netflix, I ended up with like 4 full stacks of mackerel. about 4 stacks of the shifters, 91 midnight salmon and not 1 single mount. usually when I do a binge fish like this i get anywhere between 1-4 mounts. I do 90% of my fishing at night, and I never got the mount, 30+ hours fishing. Fished for 2 hours in the morning, got 2 mounts. Maybe drop rate works like opposite of midnight salmon? 3000 casts and no mount. Off the dock in Dazar'Alor. The drop rate either got nerfed to hell last patch, or its only catachable in certain areas. I used to catch about 1-2 per hour of fishing. Seems to have gone from a crazy high drop rate to a more normalized one now. 3500 casts and no mount. Unbelievable and it is very frustrating. Tried various locations too, but mostly the Bay of Kings in Zuldazar. So just got this after the droprate nerf after like 1300 casts in coastal water. This confirms it still drops. Can anyone confirm if this is now only catchable from pools? Just a thought, it might explain the huge discrepancy in experiences, and might make pools actually useful for something. 6 hours of fishing, several locations, 1500 casts later and still no sea ray, someone send help. OK, I am at about 8k cast since nerf and no drops. For those of you that have gotten 1 since the nerf had you learned if prior? I am almost starting to wonder if they made it not drop (maybe bug?) for anyone that has the cheevo/learned mount . Do you know if I can fish the ray in Zuldazar, Xibala? I've been fishing like a mad man the last two weeks. I don't know the amount of hours but 750,000 gold earned later, I finally caught one of these last night. I really was losing hope. - I had already bought and learned it previously but did not catch one until now. I asked a GM today, he said that the mount is still obtainable and i have to pray to the rng gods for it to drop. supercool guy. i just hate blizzard and their f**king secrecy around mount drop chances and stuff. Oh how silly i was.. Should have farmed them for a whole day, would make a huge bucks right now :-/ with prices around 80K on my server..
Now i´ve been trying to get at least one, with few days of fishing, and not a single one..
Can anyone confirm if this mount still drops in coastal open waters since the change? Just caught on the side of Anyport in Drustvar in a school of fish. Took 2 tries. I didn't have the Zandalari fishing learned until after I caught it. Coordinates for the boat I fished it on are (20.1, 43.0). So i fished for the following week in all zones 2000 casts and did not find it , but yesterday i got it in Nazmir: The Sundered Span with 834 casts. Finally got it post nerf off the zuldazar docks around 57,66. Took 5000+ casts. Ended up with about a 50/50 split between slimy mackerel and sand shifter. Also,143 midnight salmon and countless grey items. Been trying for days for this, anyone had luck? Recently I decided that I wanted this mount, and went full on farming trying to get it. Every day for the past week I've spent 5 hours fishing for this mount. 1000 catches everyday to try and stave away the monotony of trying to catch it, but no luck. Every day a different BFA zone, just to mix things up. I've made well over 100K+ in gold from the AH and I believe I've crashed the fish market on my server. Despite all of that. This mount eludes me. The madness is setting in and Ferry Master Will Melborne judges me out of the corner of his eyes, but still I fish. Still I receive trash items with some casts, but all they serve is to fill my inventory. 1 stack, 2 stack, 5 stacks of red snapper. I fear that the volume of fish I catch will become so dense they may just collapse inwards on themselves, condensing into a black hole which will destroy not just Kul'Tiras and Zandalar, but the whole of Azeroth, but it is a risk I'm willing to take. I've committed too much time and energy into trying for this mount. I cannot stop now. My guild has not forgotten me, but keep their distance for fear of this madness spreading. The Trade Chat fills not with trades, but advertisements to guilds and people selling mythic dungeon runs. But there is no Great Sea Ray to be found there, so I turn my attention elsewhere. Another day of fishing. Another few stacks of Slimy Mackerel I gain. Sally Melborne watches the boat to Stormwind sail into the horizon once again. She goes not to school to learn, but learns from the adventurers who charter boats under her Father. She realises that the world around her will still carry on with or without her. What is her purpose? Why is she here? She questions her existence. Why can't she move from this spot? Will she grow old? Learn to love? Visit new and exotic lands? She does not know. All she knows is that she's afraid. She's afraid of the war. She's afraid of the future. But most of all, she's afraid of the man, if you can even call him that, whose been fishing for countless hours behind her. The expression on his face is blank. He shows no emotion. His eyes glazed over. He serves no purpose in life. Even Sally has one. She helps build her father's character. Show that he's a loving father who, despite always working as Ferry Master, is there for his daughter. He keeps her safe and provides for her. This creature however, does not. More machine than animal, it stands hunched over. Casting every few seconds when the fishing bobber shakes for hours on end. No one talks to it or even acknowledges it's existence, the dock it stands on starts to buckle under the weight of caught fish. Sally has heard of the great burning of Darnassus, the destruction of the Under City by it's own ruler, the encroachment of Horde on the shores of Kul'Tiras. But nothing scares her more than the thing that pointlessly and fruitlessly fishes the docks. Is it a physical manifestation of fruitlessness? A metaphor for the current war, needless and without a winner? Sally knows a child shouldn't be worrying about this kind of thing, and wishes her father would find a different job. The Battle for Azeroth will no doubt finish and everyone will move onto newer pastures, but still shall I be here. Still I shall fish. Still I shall be mountless. Edit: I've finally caught it! It's been well over 15K casts, but I finally caught it at the Shatterstone Harbor in Vol'Dun. Off the pier where you first land Alliance side. Perseverence, my friends, is all you need. And a lot of goddamn time. After over a week of fishing, countless hours of casting thousands of times (I stopped counting at 8,000 because it's too depressing), I have come to the conclusion that Blizzard has removed this mount from the game. I figure that since the error they made with the 1/100 drop rate literally flooded the game with Great Sea Ray mounts, they corrected their mistake by making it unavailable until such time that they decide to reintroduce it into the game. Does this need to be fished from a school? Or is there a chance to get it just from fishing anywhere in the designated areas? I have done about 600 casts and fall in completely desperation, decided that I am not going to waste my life on this. But a week later at south-east of Vol'dun coast I was about to do last attempt, maybe few hundred casts... and got this mount at 3rd cast. No pools, no lures, simple pole and 150 skill level. Maybe they set drop rate back at fesible rate? I fall in love to catch the mount and then transmogrify from trash items start look very nice. It is raining, over again. Got mine fishing off the dock in Boralis right near where the boat leaves to go to SW after about 20 stacks of fish, give or take a stack or two. So, a lot of casts, a lot of days trying. and Finally, it dropped. Hurray! Just fished one up at Seeker's Outpost in Zuldazar. 2, if I caught and sold one of these it would pay for 2 months of game time for me (I have a limited RL budget). So I, too, continue to cast and hope.... well over 10k catches in now. Edit: for reference and/or those wondering, my active fishing skill is 185 (Natural max + artifact pole + Nat's hat + hat lure + tuskan spear). Seriously, I have picked up this mount after 15 'open water' casts around 38:72 Xibala (Zuldazar). Delighted, but at the same time disappointed. Breath still slowly goes down and I expected a faster mount! Beach just down from Xibala. Thought I´d share data since I did a 2 hours sitting for the first time. Just got it in 32 tries. Started at Fishing skill 4 and got it when i hit 36. Finally Got it! Off the Shattered Span Pier. Believe in your dreams boys. Godspeed to anyone else trying for this post-nerf, just fished mine up after 13,189 casts over the course of about 50 hours in Falconhurst, Drustvar. I fished mine up yesterday in Boralus with BFA fishing skill around 5/150 with Bone Fishing Pole and Weather-Beaten Fishing Hat. Guys, it took me about 10k casts on different characters. Of course it still drops. If I didn't start fishing it, I'd probably wait some time if they will increase the drop.Enormous amount of time just thrown in trash just because of the achievement. got mine on 2k cast at 52/63 Zuldazar. After thousands of casts in various places around Zuldazar, Vol'dun, Tiragarde Sound, Drustvar, Boralus Harbor, I finally got it at 40.0, 35.1 in Stormsong Valley, off the Jeweled Coast near the Tortollan hub. I had been trying for this mount since BfA release and refused to simply buy it from the Auction House. So glad I got it done. I just caught this mount on my WW Monk tonight. Wasn't even trying for it, didn't know the mount even existed. Ironically, I got it on a toon I just levelled to 120 and am working on getting his professions caught up. So my WW Monk is a Herbalist and I got a quest from Xun Xun Sweetwater on Drustvar to go fish up 7 Lane Snapper's. My WW Monk was at 1 for fishing level. The area to complete the quest was highlighted in blue just off the docks at Anyport, Drustvar. As I was fishing open water to get these 7 Lane Snappers to get my Level 2 for Winter's Kiss harvesting, I got the mount! I was only at level 6 BFA fishing and ended up with it! After looking up how rare it is, I was quite pleased since I maxed out fishing on two other toons and didn't even know the mount existed. I didnt know this even existed until I saw it on the AH for 19k! IKR! A STEAL, so I grabbed it :)Kudos to those of you who have farmed this. Just wanted to post here about a new place to catch this mount (and midnight salmon) - the new raid Battle for Dazar'alor! My guild mate fished this up during the raid while fishing on the boat during the Stormwall Blockade encounter last night. So.... just farmed this up on my 207th cast, right around 102 Zand Fishing. From a node, so not just off a pier like some. Can confirm it's still dropping. I already had the DMF Skate, so less thrilled then I would have previously been. But this was the last fishing related mount I didn't have, so pretty happy! Good luck everyone! Decided to farm this mount while fishing for 750 frenzied fangtooth and 750 redtail loach, which I'd need in order to craft 50 feasts. Well, guess what, I failed. Finally caught mine today. 20300 catches (Fishing Buddy) in various areas. Ended up catching it in the Great Sea area, east of Boralus. Hearing the sound of the acheivement was a huge relief! Fished this up in Boralus today, so i can confirm you dont need to go outside of boralus along the coast. I have spent a total of around 8 hours fishing accross a couple different characters before this popped up. Took me around 20-30 mins - less than 100 hooks. It seems it has gotten harder to get now. This item can be fished in Zuldazar (39), Boralus (26), Tiragarde Sound (23), Stormsong Valley (19), Drustvar (18), Dazar'alor (12), Nazmir (11), Vol'dun (10) and Battle of Dazar'alor.